2. I kind of wanted to do something bigger about him. This probably won’t be that, but it will have some of my thoughts. At first brush, Ventla seems like a guy with a great gimmick. Here’s a bedroom-based music maker who wants to release 100 albums over the Internet. That’s his goal. Unlike Sufjan Stevens’ famous “an album for every state in the Union” boast – dude was never going to turn Vermont into a mini Broadway musical – Ventla’s mission seems realistic. He just keeps releasing these lovely little albums, completely unfazed by the world around him. It’s appropriate his latest offering, With No Compass, drops the same week Jesse Ruins’ A Film and a Sapphire Slows’ compilation come out. Those two acts – along with the CUZ ME PAIN label they floated around – represented one wave of Japanese self-recorded music, a segment that took everything into their own hands but still eyed blog attention and ultimately hoped for attention from bigger labels (mission accomplished for both). Ventla, then, represents a new shift in Japanese bedroom artists. Their music just appears in free-to-download ZIP files and they don’t seem all that interested in labels. They do dig collaboration though. So why write about With No Compass now? Because it might be my favorite Ventla release yet. I originally thought he was just some vaporwave guy, but Ventla has proved he’s far more versatile, his releases pinballing between all sorts of styles. With No Compass is his most neon-tinged yet, loaded with synths and robo-voiced vocals. These sounds are certainly popular all across Japan at the moment, utilized by rappers and dance-centric synth-pop units (and, uhhhh, by Daft Punk on that new album). 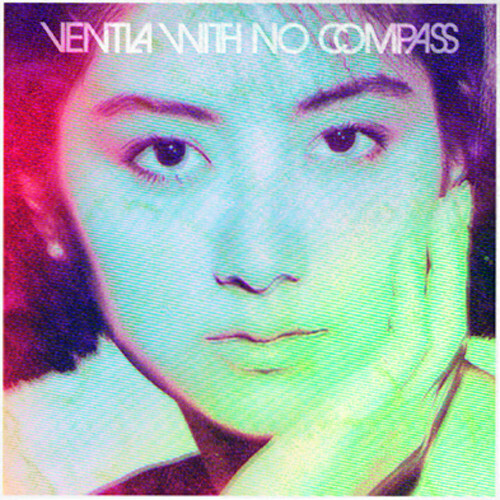 But Ventla isn’t really aiming for the dancefloor with Compass. He’s taken songs long-associated with cheesy pop and dance music and made it slower, something a touch more atmospheric without sacrificing fun (these songs can still groove – check “Abestos” or “Osutaka Memorabilia”). A highlight like “Slo-Mo Flo-Jo” could be pitch shifted into bouncy pop, but slowed down to a sweaty crawl, it becomes hypnotic. Get the album here.